Grand-Pré makes a good side trip from Wolfville. 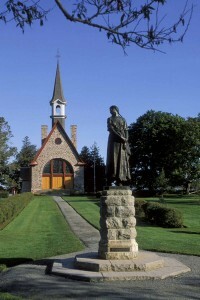 The Grand-Pré historic site tells the story of the Acadian people through to their deportation in 1755. A visitor centre explains the Acadian history but just as interesting are the surrounding gardens. Bring a picnic and stay a few hours. The centre is open from May to October, 9am to 6pm. Admission is $7.80 for adults and $3.90 for kids. See the Grand-Pré National Historic Site website for more information. While in the area, don’t miss the Domaine de Grand-Pré Winery, a great place to taste Nova Scotian wine. A 45-minute tour of the vineyard and wine tasting is $6. Tours run from the middle of May until the end of October. The winery also has an upmarket restaurant that’s open year-round. See the Domaine de Grand-Pré Winery website for more information.